Friday evening, finished with work, I flew from Houston to Kansas City with a quick Southwest Airlines stop in Dallas. In other words, twenty minutes on the ground as one load of passengers deplaned and another load promptly took their place. At about 10:00 pm I was met at the KC airport by my father, who had decided to drive 9 hours from Indiana to see me. We arrived at my sister and brother-in-law’s house well after the nieces had gone to bed, but did everything we could to keep the noise to a minimum, lest they wake up and have their surprise spoiled. 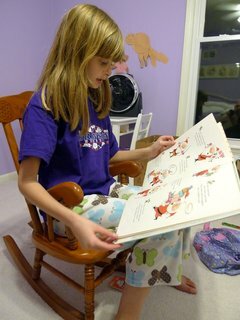 I wrapped their Christmas presents and placed them – “From Santa” – under the tree before going to bed. 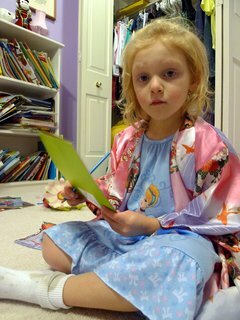 About 7:00 Saturday morning I came upstairs from the basement guest room to find the two girls, going on ages 5 and 8, glued to the cartoons. “Good morning,” I said. They turned around and for a moment you could see the wheels turning as they tried to process the disconnect between what they were seeing and what they knew to be true: that their uncle was thousands of miles away in Thailand. The youngest niece actually turned back to the TV before doing a double-take that would have been at home in a slapstick comedy. “How did you get here? !” she asked. I made my case that Santa had brought me along with the presents. To prove my point, I used as evidence the photo of me and Santa that had been taken the night before as part of a Southwest Airlines / Microsoft promotion at Houston Hobby Airport. For any number of reasons, they were skeptical of this evidence. “He looks like family,” the older niece said. Here is a four-minute video of the present opening, if you would care to watch it. I imagine relatives will be more interested than most of you will be, but it has a few cute comments made with the sheer innocence that only children can. 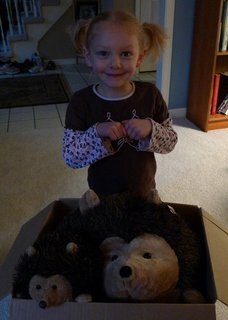 Ava received the larger hedgehog (which she has named “Judy”), a beachball sized stuffed animal that took up half my suitcase and made it inexplicably light for the baggage handlers. This one matches a smaller hedgehog we gave her on a previous visit, of which she was convinced she already had the larger one of the pair. 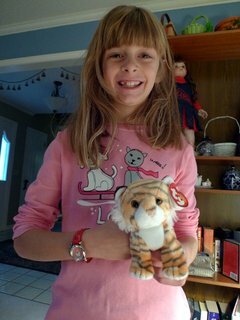 Emily received a Hello Kitty watch – her first watch ever as she is now finally able to tell time – and a stuffed tiger that was a Christmas gift from one of my colleagues, but which will have a more loving home in Kansas City than in Bangkok. We had lunch with my grandparents and uncle and then after running several errands we met another family friend for dinner at Lidia’s Italian restaurant in downtown. Andy and Sugi were unfortunately not able to drive down from Omaha to join us as they were experiencing blizzard conditions. After putting the girls to bed and saying my goodbyes, I reloaded my bags, filling the void left by the hedgehog with cans of chipotles and tomatillos. By midnight I was in bed for a few hours’ sleep before an early trip to the airport at 4:00 am. This entry was posted in Uncategorized and tagged Christmas, Kansas City, Santa, travel by christao408. Bookmark the permalink. 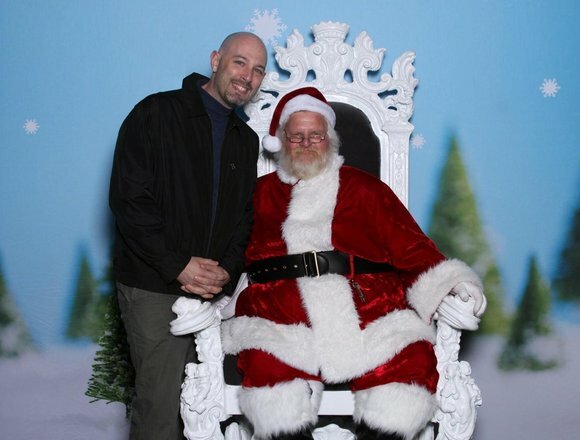 Chris, you are the bestest uncle in the whole wide world, and you are the much better-looking Santa in the photo!!!! hehe. “Oh, my God, yeah” comment in the video is priceless. You have bring joy to the nieces and thanks for sharing the wonderful Christmasy moments with us, your fellow Xangans. Merry Christmas to you and Tawn! What a nice Santa Uncle you are, just stopping over to deliver gifts from thousands of miles away! The video and photos you took are priceless. Someday, I hope they could fly over and visit you and Tawn. Well I daresay Momma Judy was a big hit! You’re a very cool uncle; wish I had one like you! @CurryPuffy – Two and a half years from now is the plan. Family vacation for my parents’ 50th anniversary. That should unleash terror on Thailand! @stevew918 – @Passionflwr86 – Such nice words. Thank you. @everyday_yogi – I’m trying to remember what she calls the little one. Something equally as incongruous. Thanks for the video! This has put a permanent smile on my face. We’ve been able to watch them grow up through your blog and they are sweet as ever. Happy Holidays to you and yours! Wow, someone is spoiling the girls lol. You were indeed Uncle Santa! Great job for the holidays. The kids are beautiful! Now you can rest until Christmas Eve when you will visit everyone else. great video! Hello Kitty is the bomb but that huge hedgehog is awesome. Glad you had a hit with them. Happy Holidays! That’s so awesome. I’m very disappointed that the weather condition was not better for us to drive down to meet you. It would have been wonderful. But I will see you hopefully in a couple of months! Hannah is the other hedgehog. Thank you again for coming in for a visit. The girls have been very excited to tell everyone about Sat. and they are enjoying their gifts. Happy Holidays! The video finally came through and I love how gracious Emily was as she opened the box containing the watch and not understanding what the present was and that, once again, my children have to be reminded to say thank you. @oldpartner – Well, they both showed their appreciation, which was the important thing and Emily was gracious enough not to act disappointed about a box with foam in it! @yang1815 – Yes, we look forward to it. @Ikwa – To you, as well! @Fatcat723 – Oh, the pressure! @sandelion23 – Oh, those are the nicest of words. Thank you. By the way, it has been several weeks since we saw any new photos of your little one! This made me smile! We had a moment many years ago when son#1 got a box with a transformer – it was all folded up as a airplane. He thought it “nice” and it wasn’t until he discovered the transformer part that he expressed the proper excitement!! hehe. Too bad your visit was so short but I’m sure Tawn will be happy to have you back home. Absolutely precious! :o) I love the hedgehog family! So cute! Your the nice uncle I never had. awwwwwwwwwwww! melts my heart! love the girls… simply to cute for words!ps you are such a good uncle! Brings to mind the year you and Jenn (one/other/both) wrapped a gift for Dad with nothing in it…a gift of air. I don’t remember the reason for this gift (probably our gag gift years), but do remember the look of puzzlement and, yes, disappointment on his face. @murisopsis – “All they got me was this lousy airplane…” Ha ha! @Sinful_Sundae – Oh, thank you. Very nice to say. @brooklyn2028 – I wish there had been a camera man to film that reaction. @jandsschultz – Oh, I don’t remember that. Hmm… wonder when that was? @amygwen – For just a single day, it was very worthwhile. @kenpcho – How have you been? Was thinking about you a few days ago and wondering what’s up with you. you are a really good uncle. but i still can’t imagine you coming out here for only 30 hours and returning home. should have taken a few more days off? @christao408 – I’ve been well! Things have been exciting for me these days. New job, new furniture purchases, new travel accessories (hehe), shoes and a happy ongoing love life with the bf. :o) It sounds like you and Tawn are still well too, which is all that I can hope for. :o) It’s been raining here rather heavily and unusually in southern Calfiornia. I was driving around LA, Pasadena and Orange County and it was pouring cats & dogs the whole time! Very bizarre weather, but I’m still having fun! I FINALLY bought a Wii to play the old super mario games when I have some down time next week while I sit at home and relax through the holiday. :o) I’ll have to re-vamp xanga as well! I’m starting a new workout too! Well, that will start in January because I sort of went on a hiatus with my workout routine. Fail. I know. Haha. Hope you’re still having fun my tall friend! :o) I’ll have to post something soon!! I’ll get back into the groove during my week off work! @kenpcho – You do need to post something again soon. Your presence has been missed here in Xangaland. @ungrandvoyage – Your presence has been missed here, too. As for staying longer, each minute I spend there is one more minute I’m away from Tawn. Trade-offs! Aw…you’re such a romantic…Andy and I only see each other for 2 days in a month (typically) and that’s usually enough. Of course I would like to be with him more often, but alas, this is the situation for now…And thanks! I’ll have to come up with new posts soon. :o) I started my holiday as of today and I won’t return to the office until January 3rd! YAY! @kenpcho – Two days a month isn’t much but I guess it makes you appreciate each minute. Hope you have a very happy holiday, Kenny. Oh, we’ll probably be in LA for a week or two in mid-July to vacation with my sister and her children. Disneyland. Ooh la la! D-land! July is so far away! If I’m here, let’s catch up if you can squeeze me into your schedule for a meal or coffee!